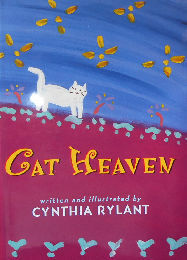 This children's cat book describes a cat's journey to heaven and how happy the cat is in heaven with God. The inside flap of the dust jacket say it all - "If you have ever been lucky enough to have a special cat in your life, then you know there is a place called Cat Heaven". Color illustrations throughout. The hard back book is 8 1/2" wide x 12" high. Copyright 1997, approximately 30 pages. Previously owned but in good condition.